How Green Was My Curry? You know you have a great friend when she offers to drive over four hours (each way) to stay at your house and take care of your animals, so you can get away for a few days. When that same friend also brings you a couple cans of the best green curry sauce this side of Thailand, you wish you could clone her. I love a good Thai green curry, but because it’s made with fresh and hard-to-find (for me, anyway) ingredients and with no Thai restaurant nearby, I rarely have a chance to enjoy it. 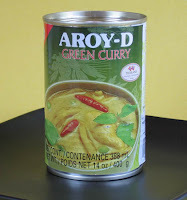 Moreover, I had never found a commercial green curry sauce that had a “wow” effect, until Sam turned me onto a brand she found in Guam — Aroy-D. Although I’ve seen it online ($5.99 shipping for a $2 can of sauce? ), neither of us have been able to find it at our regional Asian markets, so the last time Sam went to Guam, she brought home a case of the stuff. And, generous soul that she is, she gave me a couple of cans from her private stash. That stuff is fantastic — as good as any I’ve had in a Thai restaurant. And it's makes a quick and easy meal that tastes like it took forever to prepare. For the dish you see in the top photo, I stir-fried extra-firm tofu with sliced onion, bok choy, green peas, and a red chile. Once everything was cooked, I simply added the green curry sauce and simmered it for a few minutes, then served it over some brown rice. Mmmm. Thanks again, Sam! 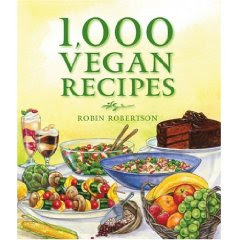 I still don’t think it’s quite hit me that, yes, I wrote a book containing one thousand vegan recipes. After three (long) years of writing, testing (thanks again, testers! ), and tweaking, I can tell you that I’m absolutely thrilled that the publication date is near — the book comes out October 5th. As you might expect, I’m happy to be finished because of the intense work involved. But more than that, I’ll be excited to see this book in print because of what it represents. At 640 pages, this hardcover book is a reminder of how far the popularity of vegan cooking has come over the last several years. It wasn’t all that long ago that there were only a handful of vegan cookbooks in print, let alone one that contained a thousand recipes. Fast forward a few years and now the shelves are literally filled with vegan cookbooks. But to me, 1,000 Vegan Recipes is more than just a cookbook. It also represents three years of my life and, more importantly, a little piece of vegan history. 1,000 Vegan Recipes is part of an ongoing “1,000 Recipes” series on various cuisines published by John Wiley & Sons, Inc. Ten years ago they released 1,000 Vegetarian Recipes and I think it says a lot that, ten years later, they are now publishing 1,000 Vegan Recipes. In the Introduction, I relate that people often ask me “What does a vegan eat?” and soon I’ll have an easy answer — I can just show them a copy of this book! 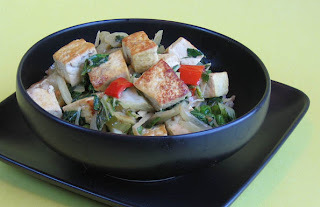 You can read more about 1,000 Vegan Recipes on my website, GlobalVeganKitchen.com. The book is available for pre-order on Amazon now. In the coming weeks, I’ll be sharing some of the recipes from the book and look forward to blogging more often now that I’ll have more time. I enjoy making Thai curries from scratch, however, I don’t always have the time or ingredients on hand to make it happen. The fact is, there isn’t a lime leaf or piece of lemongrass to be found within an hour of my house, so when I run out of ingredients it can often be several weeks before I replenish my supplies. That’s why I was intrigued when the folks at Curry Love sent me samples of their new line of organic curry sauces. They come in three flavors: Passion Red Thai Curry (hot), Luscious Yellow Thai Curry (mild), and an intriguing Blissful Banana Ginger flavor (medium-hot) — I think I’ll use that one to make some laksa. I tried the mild yellow curry first, and it smelled wonderful right out of the jar. 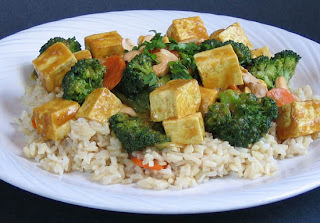 After stir-frying some onion, carrot, and tofu, I added some steamed broccoli and the curry sauce and simmered it all together for a few minutes. To serve, I spooned it over brown rice and garnished it with a sprinkling of cashews and cilantro. It was as flavorful as the yellow curries I’ve had at Thai restaurants, and I expect the other flavors will be equally good. When I’m too busy to cook and crave some curry, it’s good to know a quick and easy meal is as close as my pantry.